The Historic Centre of Siena has been well preserved since the 12th and 13rd century. Its urban fabric, size and artistic identity distinguish Siena from other medieval urban centres in Italy. The city derived its wealth from banking activities - streets named Banchi di Sopra and Banchi di Sotto are a reminder of this. Siena also was the main rival of Florence, with which it disputed over territorial expansion. The city had gained independence in 1189. The period that followed was to be crucial in shaping the Siena we know today. It was during the early 1200s that the majority of the construction of the Siena Cathedral (Duomo) was completed. It was also during this period that the Piazza del Campo, now regarded as one of the most beautiful civic spaces in Europe, grew in importance as the centre of secular life. New streets were constructed leading to it and it served as the site of the market, and the location of various sporting events. 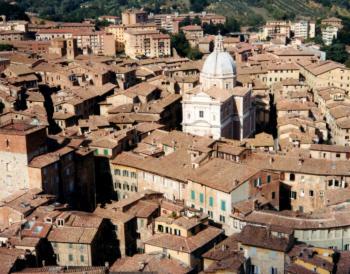 With over 50,000 inhabitants, Siena is quite a bit larger than the other medieval towns in Tuscany. Although it also has been preserved well, I found it a lot harder to like (even tacky in some parts). I had to walk for about 20 minutes from one of the parking lots that surround the city center and are aimed at handling loads of tourists (and their buses) in the summer time. Parking at the Stadium is much closer, though not free. My first glimpse of something grand was at the Baptistry, an enormous white-and-black marble building. It is adjacent to the splendid Duomo. This cathedral has an overly decorated gothic facade, and a striped bell tower almost like a minaret. Its dome is under construction at the moment and covered up. The colours black and white are used all over the design of the Duomo, as they are the colours of Siena's coat of arms. The shell-shaped Piazza del Campo undoubtedly is the highlight of Siena. The square houses several monumental buildings, like the Palazzo Pubblico. 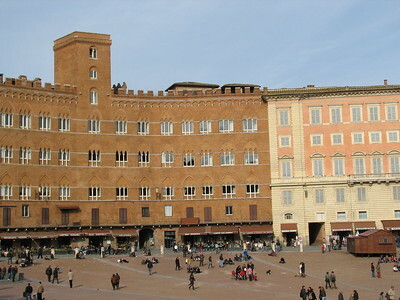 It is also the place where the Palio horse race is run twice a year. I've watched that spectacle on TV once, and it is hard to imagine the crowds and the nervous horses at this so gentle public square. A sight not to be missed there is the 15th century Fonte Gaia, a fountain that is adorned on three sides with bas-reliefs. As a stopover on my way from San Gimignano to the Val d'Orcia I had an hour or so to kill in Siena. I had been before twice, but still looked forward again at the chance to have another peek at Siena. The previous time I had visited my original plan had been to also tick off San Gimignano the same day. But when faced with the choice on skipping on the Duomo in order to catch my train to San Gimignano or staying in Siena for the rest of the day I fortunately went all in and stayed. It was well worth it and I would encourage you to do the same. Siena to me is the quintessential Tuscan city world heritage site. Pisa may have the most iconic construction in the Leaning Tower and the Piazza del Duomo, Florence the greater collection of individual sites in the Duomo, the Uffici and the Ponte Vecchia, San Gimignano and Pienza the more picturesque location. But none offer anywhere near the same level of consistency or size that Siena offers all the while not being short on stellar sites itself: the Duomo of Siena, the Campanile, ... there is plenty here to take in. Interestingly, Siena feels a lot less touristy than any of the other Tuscan cities. I would guess it's a combination of the relatively large size and the lesser publicity it gets. Siena is connected by train to Florence and Pisa. On weekdays there are also direct busses to San Gimignano. Alternatively, you can take the train to Poggibonsi and catch a bus there. Via Grosseto you should also be able to get to Tarquinia. If you plan to head to Val d'Orcia and Pienza there are some busses but these don't run all that frequently, especially on weekends and holidays. In my case I took the train to Buonconvento where I stayed for the night before taking the first bus to San Quirico the next morning. The Siena train station is quite far outside of the city center, up the hill, then down the escalades. Plan sufficient time to get there (20min). Siena served as a scheduled rest stop during my tour of mainland Europe in the fall of 2003, and I thoroughly enjoyed my few days of relaxation and exploration in the town. Siena is probably most well-known for its annual Palio races, held twice a year at the Piazza del Campo in the center of town. On my first night in Siena I realized why the neighborhood where I was staying was festooned with green and orange flags and banners; the contrade (or district), called Selva, had won the Palio in July, and they were celebrating with a feast in the square below. Siena is composed of 17 contrade, and over the next couple of days I spent time wandering the narrow, winding streets of each neighborhood, looking for flags or seals marking their contrade. 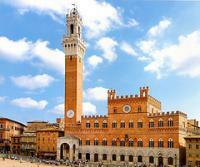 In the center of town was the amazing Piazza del Campo with its town hall and Torre del Mangia. The views of the fan-shaped piazza and the surrounding town and countryside from the tower were spectacular. Other explorations in town led me to city walls, cisterns, and churches; I particularly appreciated the rich interior and exterior of the Siena Cathedral, with its distinctive black and white striped bell tower. Siena is a beautiful town that I would love to return to some day. Logistics: Siena can be reached by train, bus, or automobile from other major cities in Italy. The town itself is worth exploring extensively on foot. Siena's black and white striped cathedral imparts a joyous, partyish feeling inside and out. Inside the cathedral, the Bernini statues of the Magdalen and St. Jerome who are lost in mystic ecstasy are incredibly beautiful. The interior of the cathedral is much more spectacular than Florence's. We loved the pan fuerte, Siena's special fruitcake, too. I visited this WHS in May 2003. 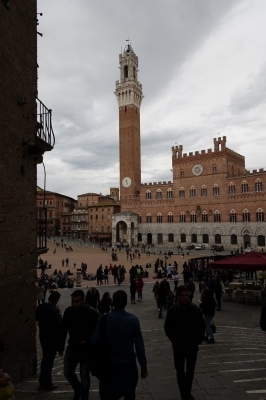 The heart of the medieval city of Siena is Piazza del Campo where the local Palio takes place. there filled with delightful little shops and businesses. I can see why it is described as the heart of Tuscany. I seem to be one of the few people who like Siena less than Florence, but since I like Florence a lot, that doesn't mean that Siena is not a very nice city and a great place to visit. The unique cathedral and the stunning Piazza del Campo make Siena special and I would gladly return there to see more of it. Siena, the perennial rival of Florence, may not equal its neighbour to the north in sheer artistic achievement, but its charm and exuberance is all its own. The center of town is dominated by the Piazza del Campo around which every summer the Palio, a no-holds-barred horse race, is run to the delight of locals and tourists alike. Siena is also home to an unusual cathedral, which still sports the initial foundations of a massive planned expansion of the building that was cut short by the arrival of the plague. And of course, all of this is best seen while munching on one of the local ricciarelli, almond-based cookies. Rococo: Synagogue - "represents one of the few examples of architecture between Rococo and Neoclassicism"
Unfinished constructions: Duomo: After the completion of the transept and the building of the east wall, the money ran out and the rest of the planned cathedral was abandoned. Botanical Gardens: This Botanical Garden, Orto Botanico, was founded in 1784 by Biagio Bartalini. Historical Financial Institutions: Banca Monte dei Paschi di Siena S.p.A., the oldest surviving bank since 1472. Located in Palazzo Salimbeni. Oldest companies: "Banca Monte dei Paschi di Siena S.p.A." Oldest continously operating Bank in the world. Founded in 1472, originaally on "charitable principles" as a pawnbroker with the aim of covering its operating costs whilst avoiding usury. Legends and Folk Myths: According to legend, Siena was founded by Senius, son of Remus, who was in turn the brother of Romulus, after whom Rome was named. Statues and other artwork depicting a she-wolf suckling the young twins Romulus and Remus can be seen all over the city of Siena. Built in the 13th century: The cathedral was originally designed and completed between 1215 and 1263 on the site of an earlier structure. 435 Community Members have visited.